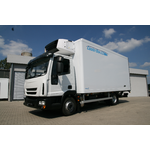 We are one of the leading German manufacturers of refrigerated truck bodies for light trailers, vans and trucks. Our factory is located in Baden-Württemberg, in the Rhine-Neckar-Region. We provide our products to any industry that has the need to move temperature sensitive goods. These include the food trade, the food industry and their service providers such as freight forwarders and logistics companies, rental companies, etc. Also, the pharmaceutical industry is an important branch of our market. We are one of the leading German manufacturers of refrigerated and insulated truck bodies for light trailers, vans and trucks. Our bodies are used for the transportation of temperature sensitive goods like perishable food, pharmaceutical products, etc.